With the help of object hierarchy large mapping projects with many sub projects can be managed and evaluated comprehensively. The mapping projects within a hierarchy are stand alone mapping projects linked by a common mapping template. With the help of this template layer and group structure, legends and title blocks can be adapted automatically for all projects. After finishing the mappings a common quantity survey of all mapping projetcs can be created. The navigation map in the hierarchy was integrated as a comprehensive mapping project and can be now also edited with all features of a mapping project. Via the navigation map, project properties (attributes) and mapping quantities can be visualised and analysed across projects. To simplify the passing on of title blocks within the hierarchy, new properties for the entries in title blocks were introduced. 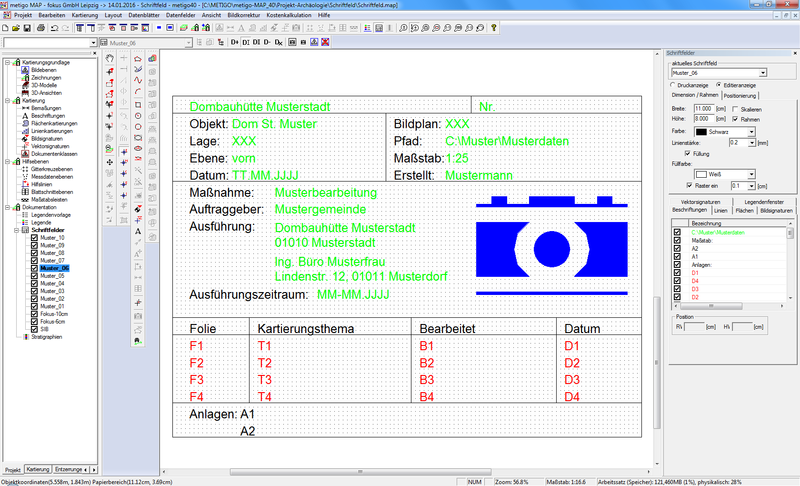 These enable to define lines, annotations and symbols as fixed, variable and local. Therefore, the consequent editing and passing on of title blocks in the hierarchy is possible. Assigning user-defined project information (e.g. materials, activities, responsibilities) the linked areas of each mapping project are coloured according to their data content. Hence a clear representation and export of project information is possible. 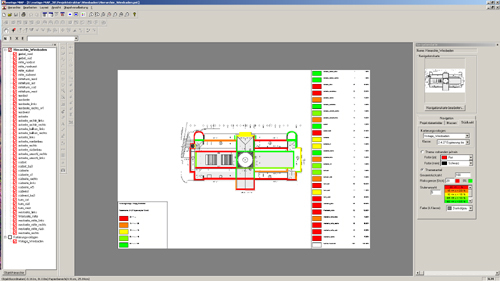 The display and export of the relative part of a mapping topic or the absolute amount of an action over all mapping projects can be done in the same way. 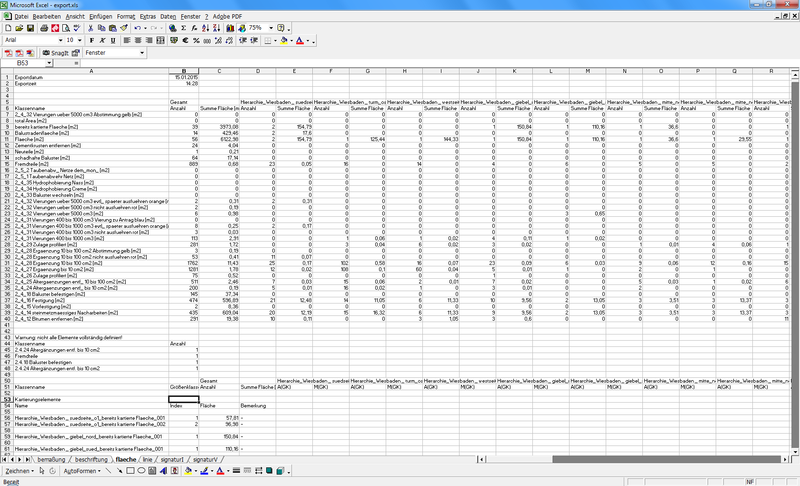 Quantity calculation and object data can be exported as a whole into text files and table calculations (MS Excel, OpenOffice) or be processed in databases. By means of the mosaic feature, a mapping project can be split in several partial sub-projects with an overall mapping template and rejoined after mapping to a single project. The applications for this purpose are by example the subcontracting of project parts to several conservators, the joining of various mapping phases (condition, material, planning of conservation measures, documentation and accounting) or the continuous condition mapping in loans. Creating sub-projects, the software generates project indices which are defining the origin of each mapping element and the additional exchange of modifications between mosaic project and its sub-projects. Via mapping history (creation and modification date), new and modified mapping elements are analysed and editing conflicts will be avoided when exchanging mapping elements between mosaic project and its sub-projects later. By creating several users for the involved contractors with restricted revision rights, it can be secured that each user is only permitted to edit, alter and delete his own mapping results. 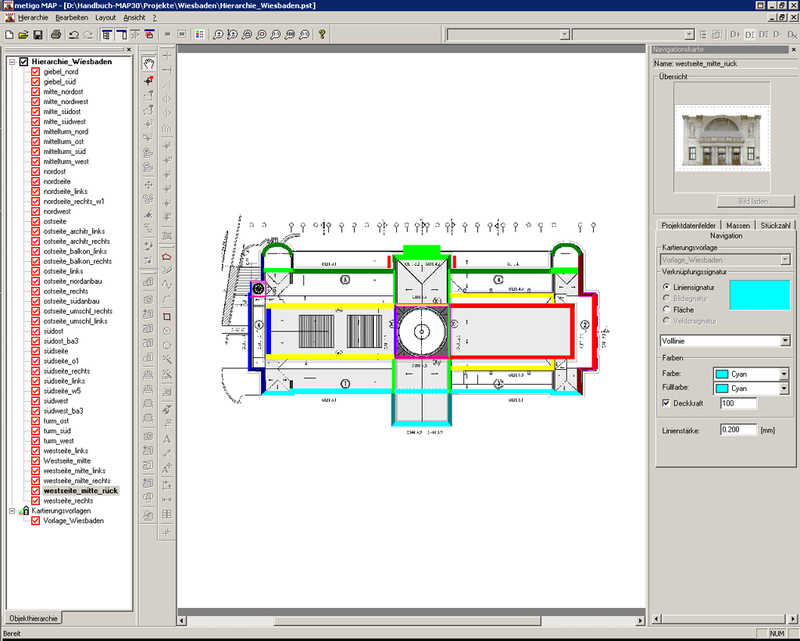 The general conservator for the complete project (administrator) can analyse and edit mapping projects in the overlapping areas and return these modifications to the sub-projects.